At some point, we perfume fanatics look at our collections and wonder, “Do I have too many bottles of perfume?” While the answer is obviously “no,” I have also asked this question about several things I enjoy collecting like scarves, lipstick and body oils. Yes, body oils. I have at least four in my current rotation including evanhealy’s Sweet Blossom Hydrating Oil, Malie’s Jasmine Rose Beauty Oil, Intelligent Nutrients Total Body Elixir in Focus (review to come) and the most recent addition, Tallulah Jane’s Natural Body Oil in Aiyana. There are many more in my stash, but these are the bottles you’ll find on my bathroom counter. Aiyana is a body oil for those of us who are serious about our body oils. The list of ingredients includes a luxurious blend of all natural oils that are anti-inflammatory (jojoba oil), rich in antioxidant Omega-3 fatty acids (camelina oil), hydrate the skin with exceptional triglycerides (meadowfoam seed oil) and impart regenerating benefits (pomegranate seed oil). With a roster like that, it’s no surprise this oil feels rich and extra hydrating to thirsty skin. What’s more remarkable though is how quickly it’s absorbed as well as Aiyana’s full-bodied scent that lasts for hours and hours. When I read that Aiyana’s notes include Moroccan Rose, vanilla and pear, I was anticipating a sweet, rosy fragrance. What I didn’t realize, was that I had skipped over the text that mentions rock rose (cistus essential oil) which ultimately dictates the fragrant experience. Rock rose creates a scent that is more deep and resinous than sweet, which is not to say vanilla and rose aren’t present, they are. But their contribution is a subtle infusion of sweetness and petals that curl themselves around the warm and ambery essence of the cistus. Aiyana is also musky in a loamy soil kind of way that’s reminiscent of Weleda’s Wild Rose line, but with more depth and complexity. Aiyana has found a welcome home amongst my favorite body oils, and I am quite happy to have discovered this uniquely resinous rose that nourishes my skin and makes me smell beautiful all day long. I am however, loath to keep this beauty all to myself, so I’d like to share some with my readers. Please leave a comment if you’d like to receive a sample of approximately 10mls of Aiyana from my own bottle. (I can only ship to US at this time, sorry!) This might be my last post until I get back from a spring break jaunt, so I’m not sure when I will announce the winners. But keep the comments coming and I will let you know the results in due time. Winners have been drawn! Disclosure: A sample was sent to me for consideration by Tallulah Jane. The opinions in this review are my own. I was not financially compensated for this review or any other. Mmm, cistus-y! I adore body oils and this really sounds lovely. Please enter me in the draw. Thanks Trish! Speaking of body oils I just made one today~ I’d love to be entered in, T.
What a beautiful review Trish! Sounds luscious! Thanks for the giveaway too! Thanks for the sample! You are most generous. I look forward to trying it! hmm resinous rose!! Count me in! How generous of you!! I’d love to sample this–sounds so pretty! Have a fun Spring Break trip!!!! “musky in a loamy soil kind of way” has got me interested. I would love a sample! This was my first winter using oils rather tha lotion and it had been so much more effective! But I’ve just been using straight oils. No blends or scents. I’m ready to broaden my body oil experience! I hope you enjoy your jaunt. You have piqued my interest in Aiyana! I would love to try a sample. Thanks so much for the giveaway! You are quite good at making me swoon/desire all things you review! I`ve not used oils for fear of sticky-ness/stains on clothes, but you are persuading me to try! Thank you for the contest!! Sounds very exciting to me! What is it about spring that gets me longing for a new scent(s)? This has happened to me each spring since I was about 16 or so. I love fragrance in all forms, and I would love to sample something divine! This sounds really wonderful! 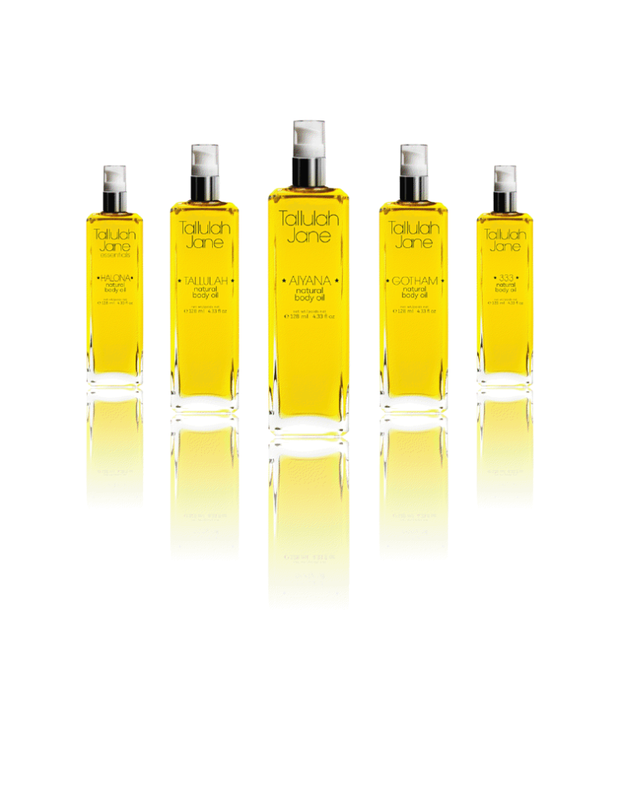 I really like Tallulah Jane’s 333 perfume, haven’t tried body oils yet, but I think this would be lovely. Thank you! I’d love to try this — what a gorgeous blend of oils!